Lodging options abound in downtown Ithaca, with great stays at locations such as the historic William Henry Miller Inn, the ten-story Hotel Ithaca, the downtown Hilton Garden Inn or the new Marriott on the Commons. Quality accommodations in the surrounding area run from cozy bed & breakfasts – many within easy walking distance to the center of downtown – to comfortable hotels that offer the latest in services and amenities you want at the value you expect. Downtown Ithaca lodging is conveniently located near Cornell University and Ithaca College with many of the Ithaca area’s major businesses nearby. The Ithaca Commons is a few steps away and has some of the area’s best restaurants and shopping. Both your business and leisure travel needs are present in a variety of options from comfortable and practical to luxurious. *Early reservations are essential on key college weekends such as homecoming and graduation. The Argos Inn, built in 1831, is currently on the state historic register and will soon be on the national historic register. In addition to guest rooms, the Argos Inn has a neighborhood cocktail lounge and event space, all restored into a LEED-certified hotel. 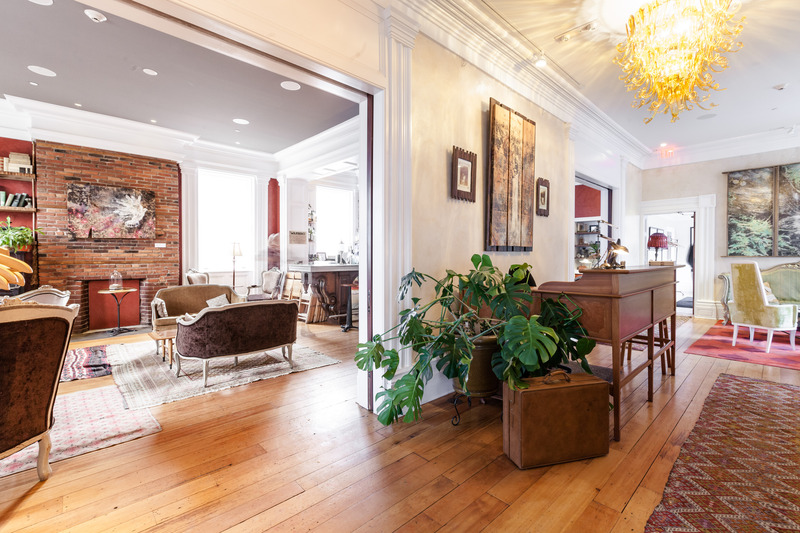 Modern amenities include heated bathroom floors, Nest thermostats for the geothermal heating and air-conditions, free fiber-optic internet, 19th century furniture restored with a modern flare and a collection of original art pieces by renowned 20th century artists. The Hilton Garden Inn Ithaca is located in downtown Ithaca just off the Ithaca Commons. Some of Ithaca’s best local restaurants and shopping are within walking distance of the hotel. The Hilton Garden Inn Ithaca is conveniently located near Cornell University, Ithaca College, and many of the area’s major businesses. The Hilton Garden Inn Ithaca features 104 spacious guest rooms; each guest room has a large work desk, ergonomic chair, beds with adjustable firmness, high-speed internet access, and a refrigerator and microwave. 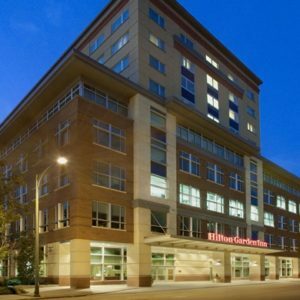 The Hilton Garden Inn Ithaca offers a 24-hour business center with complimentary high-speed internet, an indoor pool and whirlpool, fitness center, and 24-hour Pavilion Pantry. 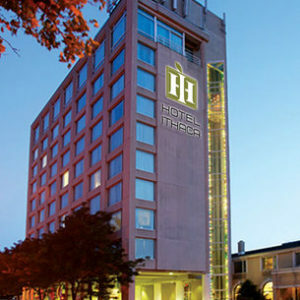 Hotel Ithaca is located in downtown Ithaca just off the Ithaca Commons. Hotel Ithaca offers guests a 24-hour business center with free high-speed internet and fax, print, and copy services. If you need to hold a meeting or event, the 3,000 square foot ballroom is divisible into three rooms for smaller meetings and breakout sessions. Hotel Ithaca offers a complimentary shuttle service to the Ithaca Airport and has a full-service restaurant – Max’s American Grill & Sports Bar – located inside the hotel. Hotel Ithaca has an indoor pool, 24-hour lounge, 10 floors of guest rooms, and much more! The aptly named Ithaca Marriott Downtown on the Commons is located on the Ithaca Commons, adjacent to restaurant row, and within two miles of both Cornell University and Ithaca College. This brand new hotel is Ithaca’s only full -service branded hotel, and offers 159 well-appointed rooms that merge sleek design with functionality. Offering nearly 3,000 square feet of meeting space with floor to ceiling windows overlooking the Ithaca Commons, creative menus, state of the art audio visual, and comfortable seating, the Ithaca Marriott Downtown on the Commons is the place to be in a meeting. The Bar + Restaurant, Monks on the Commons, offers three delicious meals a day featuring locally sourced food and fare, indoor and outdoor seating, and a mixologist that will provide you with the latest drink trends in a warm and welcoming setting. The Ithaca Marriott Downtown on the Commons offers complimentary shuttle to the Ithaca Tompkins Regional Airport, Cornell University, and Ithaca College. The canopy Hotel brand is an emerging boutique hotel experience developed by Hilton Hotels. This modern and unique type of hotel experience is marketed towards the millennial generation (those born between 1980 and the mid-2000s), however, is relevant for the older generation of hotel guests. Each canopy Hotel is designed to incorporate the essence of its local surroundings and neighborhood feel; such as offering a local welcome gift and evening tastings of local food, beers, wines, and spirits to providing local fitness and recreation options in terms of jogging and bicycle routes (bicycles will be available for rent). 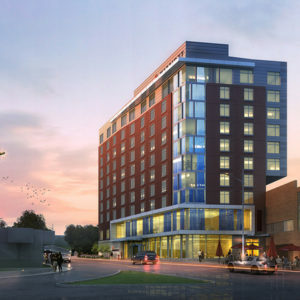 The canopy Ithaca by Hilton will provide approximately 123 guest rooms, a restaurant (2,000 SF), a small board room and meeting room (1,000 SF), a fitness room, and a café/bar area. 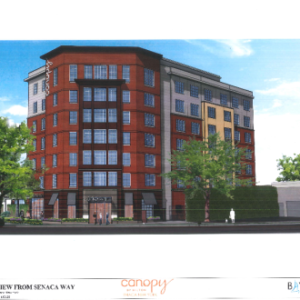 The plan also includes a porte-cochère for guest drop-off and pick-up, valet service for guests, and a guest parking zone along Seneca Way. The William Henry Miller Inn was built by Cornell University’s first student of architecture, William Henry Miller. 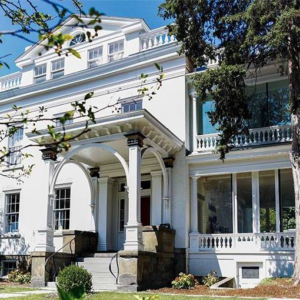 Initially built as a personal residence for the Stowell family in the late 1800s, the doors of the William Henry Miller Inn first opened in 1999. 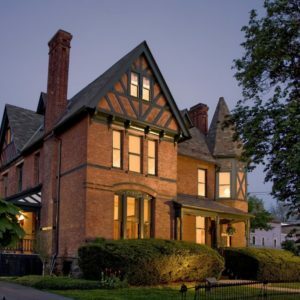 The Inn is decorated with American chestnut woodwork, stained glass windows, working fireplaces, and includes seven guest rooms and one carriage house – all accommodations have private baths among other amenities. Built in the 1830s, the Inn on Columbia provides gracious accommodation to travelers from all over the country and the world. 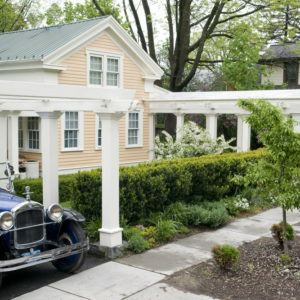 Fireplaces, decks, skylights, whirlpools, and custom-designed furniture make the Inn on Columbia an experience of unequaled quality: a welcome retreat in the Finger Lakes Region of New York.